Tokyo Sushi Academy(TSA) is Japan’s premier sushi school. It was also the first school opened with the sole purpose of teaching the art of sushi making. TSA Tsukiji will offer Sushi Making Workshop for foreigners and Japanese. We offer a 90-minute intensive course in making sushi. 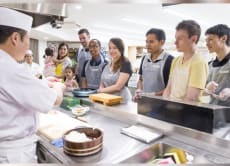 Our skilled professional sushi chefs deliver high-quality lessons that capture the very essence of Edo-mae sushi, teaching you how to make sushi with the utmost care and attention to detail. First 30 min, you will learn how to make Sushi, and enjoy yourself next 60 min for all you can make and eat authentic sushi with your friends!